soon after opening of orientation workshop on Wednesday. As preparations for the May 20 Tripartite Elections intensify, the Malawi Electoral Commission has scheduled nationwide trainings on nomination process for Constituency Returning Officers (CROs). The CROs will manage the nomination process at the constituency level whereby they will be responsible for receiving nomination papers from parliamentary and local government elections. For the first time, the Commission has to conduct interviews, whose candidates were Primary Education Advisors, to identify suitably qualified CROs. 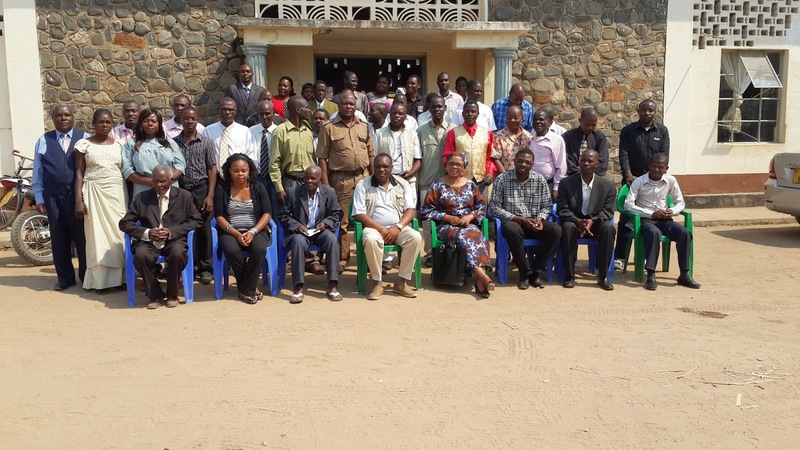 Speaking in Balaka when he opened the orientation workshop for CROs from Machinga and Balaka district councils on Wednesday, January 8, 2014 Commissioner Dr Wellington Nakanga urged the participants to be neutral and impartial in their work. “Whatever you will do as Constituency Returning Officer, will not reflect on you, but it will be the image and integrity of the Commission that will be at stake”. “If you will conduct yourselves professionally, the public will praise the Commission of being professional. If you discharge your duties in a partisan way, taking political sides, un-leveling the playing field and indulging in all that sort of behavior not condoned by the Commission, it will also be the image and integrity of the Commission that will be at stake. The Commission will not condone this,” he said. Dr Nakanga emphasized that the Commission was determined to deliver a credible election and would not tolerate anyone to sabotage the process. “Be informed that the Commission will not hesitate to nip that in the bud any behaviours or acts that would affect its integrity. We are coming from registration exercise which has been successful and we will not accept to fail on nominations,” he warned. The Commissioner cautioned the CROs that there was no room for experimenting, rehearsing or asking for second chances and they had to just get everything right the first time as they discharge their duties. The Commissioner said for 2014 elections the aspirants will deposit their nomination fees with any branch of the Malawi Savings Bank and attach the deposit slip to the nomination papers. The Commission has planned to start issuing nomination papers from January, 2014 and will receive them back from 10 to 14 February 2014. Similar training took place in Chikhwawa, Mulanje, Lilongwe, Salima, Mzimba and Chitipa and were presided over by MEC Commissioners.